Time Crisis Strike is a loud and flashy first-person shooter for iPhone with clever gyroscopic and multi-touch gameplay, adequate graphics, and solid re-playability. The game offers a solid arcade feel while embracing the iPhone’s unique capabilities. Time Crisis Strike is an original iPhone game based on the once-popular coin-op light gun shooter. Of course, some of you may remember back to the time when most video games were played in arcades, and you might have played the pedals-and-light-gun version of Time Crisis in one of them. Playing the $6 game on your iPhone isn’t a one-to-one recreation of that experience, but it’s fun nonetheless. If you’ve never played the game or its predecessors, here’s the gist: When you see bad guys, shoot ‘em dead. If they’re firing at you — duck. You’re tasked with gunning down scores and scores of terrorists, each of whom is seemingly singularly obsessed with killing you. Since your iPhone doesn’t sport any pedals (yet! Griffin Technology, are you working on anything?! ), you “duck” (and reload) by tilting the iPhone away from yourself. To shoot, you just tap on the enemy you’d like to fire upon. You can’t just spend the whole game ducking bullets: A timer ticks down how long you have to clear each wave of attackers, and if you run out of time, you die. Ultimately, if you’re comparing the gameplay to your fond, nostalgic memories of the arcade version, you’re bound to come away a little disappointed; there’s a substantial difference between using a light gun to shoot bad guys and pointing your finger on a touch screen. But considered on its own merits, the driving soundtrack and the constant bullets flying in Time Crisis Strike definitely serve to get your motor revving in short, mobile bursts. 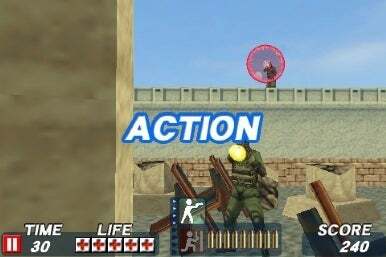 The game offers three separate gameplay modes: Arcade, which lets you play through all three levels; One Stage Trial, where you pick which of those three levels you’d like to attack; and Crisis Mission, which features five unique missions — that can be unlocked after achieving success in Arcade mode. The graphics perform capably — the 3D images render quick and without choppiness. The image quality isn’t astounding, and this isn’t the iPhone’s best looking game, but it absolutely looks good enough. You can grab a free “Lite” version that offers just one level to see if you’ll enjoy the game. Whether you remember the arcade version or are a newcomer to the series, shooting at gun-firing bad guys on your iPhone is a cathartic tension-reliever, and it’s oddly empowering to wield so much firepower with your index fingers.